Get involved with the #NewEraEagles in 2019! Heat sponsorship is an affordable and entry level way of advertising a business, commemorating a loved one, or just passing on your message. Your company name/logo or memorial and name will be printed on the scorecard in the middle of the programme at each home meeting. You will be announced over the PA system prior to the actual race and as part of the race result. All heat sponsors names will be on the Backboard on our Eagles TV Sponsorship Board and visible during filming of interviews. The cost ranges from £150 for an individual or memorial up to £200 for a company, with five of the fifteen heats remaining available for Sponsorship. An affordable way to promote your business on race nights. 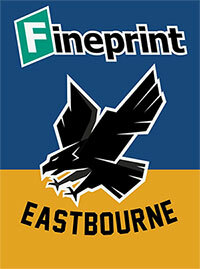 The award-winning Eastbourne Speedway match programme is acclaimed throughout the sport for its superb print quality, excellent design and informative content. Your advert will be seen by all programme buyers and is a very popular and affordable way of getting your business to a wider audience. If you would like to discuss either Heat Sponsorship or Advertising in our award winning programme, please don’t hesitate to contact us via e-mail commercial@eastbourne-speedway.com or click here to fill in contact form on our Commercial page.